A few weeks back, I wrote about some good news, namely the evidence that rule of law efforts – instilling accountability and legal certainty through support to formal adjudicatory institutions – is central to equitable development. As well as some bad news, that being that said evidence was difficult to measure and therefore of lesser interest to those development donors fixated on checking the log-frame boxes. This is the rule of law in action at the local level, and it is building, often from scratch, a culture in which disputes are settled peacefully and benefits distributed transparently. The alternative – recourse to violence in the face of unequal access to resources – has led to a cycle of political instability in many countries, with the consequent lack of economic development that has come to characterize much of Africa’s recent history. As the debate on the post-2015 Sustainable Development Goals unfolds at the United Nations this year, it is my fervent hope that African governments will endorse the inclusion within these goals of measurable targets for access to justice. To be sure, the dominant themes that are emerging in the UN discussions – jobs, economic growth, infrastructure development, and poverty reduction – are all still desperately needed across the continent. But the rule of law is a fundamental principle that does more than promote economic growth, and it would be a serious mistake not to include it in the SDG agenda. Approximately three billion people around the world live without secure rights to what are often their greatest assets: their lands, forests, and pastures. Increasing demand for land is leading to exploitation and conflict. Giving communities the power to manage their land and natural resources would reduce poverty and promote sustainable development. Securing property rights for all individuals, including women, is necessary to improve financial stability and personal safety. Where legal empowerment efforts take hold, the results are visible and quantifiable. Women in Bangladesh who challenge the practice of illegal dowries are reporting greater cash savings. Due to the work of community-based paralegals, grievances in Liberia are being resolved more equitably, resulting in greater food security. Prisoners in Kenya have returned to jobs and families after successfully appealing their sentences. The emphasis on “visible” as well as “quantifiable” strikes me as astute. One of the unsatisfying aspects of sheer quantification is that it can be blind to context. Measuring the number of judicial decision referring to international human rights standards is fine, for instance, but do the rulings properly apply the standards or misinterpret them to abusive ends? And who is to be the judge of that, and on what criteria? And in either case how many such decisions actually survive appeal? Sustained engagement with a particular development setting is not a guarantee of good analysis, but provides an opportunity for sensitivity to context and local dynamics that would not otherwise arise. The results can provide visible evidence for those minded to see it, but whether this will always be quantifiable is another question. Empowering communities to document and protect their land claims: A solution to the global land grab? Rachael Knight is the Program Director of the Community Land Protection Program at Namati, a new global legal empowerment organization, and author of its recent report on community land titling. She previously served as Director of the International Development Law Organization’s (IDLO) Community Land Titling Initiative, working to document and protect the customary land rights of indigenous groups in Uganda, Liberia and Mozambique. For billions of rural people, land is their greatest asset: the source of food and water, the site of their livelihoods, and the locus of history, culture, and community. Yet more than ever, rural land is in demand. In recent years, governments in Africa have been granting vast land concessions to foreign investors for agro-industrial enterprises and forestry and mineral exploitation. According to recent data, transactions covering at least 57,393,083 hectares of land have been granted or are under negotiation. Often, governments grant concessions with the goal of stimulating development and strengthening the national economy. Yet such concessions are further exacerbating trends of growing land scarcity and weakening the land tenure security of rural communities. Even when communities welcome private investment, they may not be consulted about the terms of the investment, properly compensated for their losses, or given a say in land management after the investment is launched. Alternatively, such investments may be undertaken in ways that lead to environmental degradation, human rights violations, loss of livelihoods, and inequity. In this context, protections for rural communities and their lands are urgently needed. In some countries, national laws allow communities to register or title their lands as a whole and then manage their land according to local needs and interests. Such community land documentation processes – which document the perimeter of the community according to customary boundaries – are a low-cost, efficient and equitable way of protecting communities’ customary land claims. 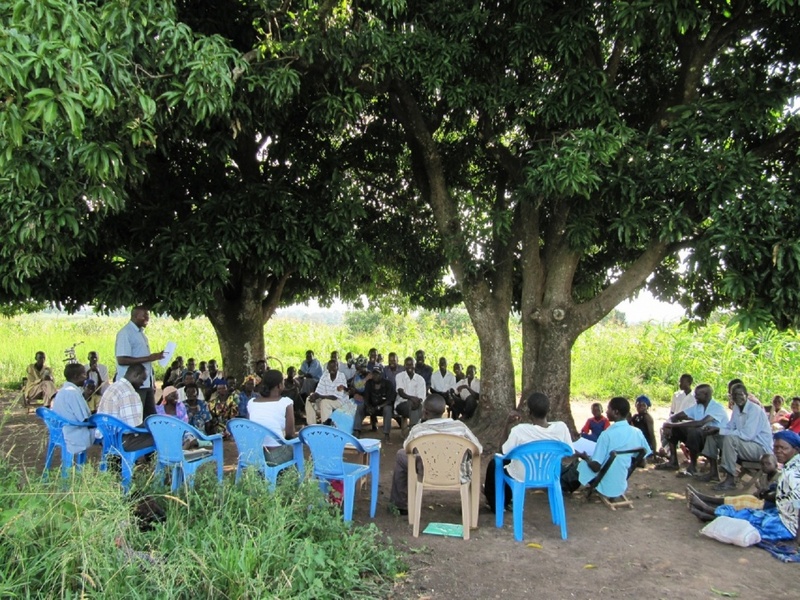 Community land documentation efforts not only protect large numbers of families’ lands at once, but also the the forests, water bodies, and grazing areas that rural communities depend on to survive and are often the first to be allocated to investors, claimed by elites, and appropriated for state development projects. Importantly, formal recognition of their customary land claims gives communities critical leverage in negotiations with potential investors. However, because these laws transfer control over valuable lands and resources away from the state and into the hands of the community members themselves, governments have so far dragged their heels in implementing them. For example, in the 14 years since the passage of Uganda’s Land Act (1998), not one Ugandan community has yet gained title to its customary lands.